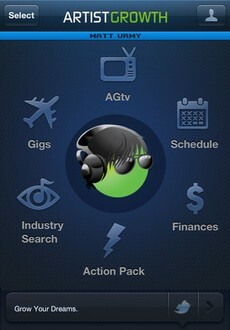 Artist Growth is a web and mobile app designed to amplify the entrepreneurial spirit of musicians everywhere. What’s next after first signing up? It’s time to customize your green, spherical avatar with a mesh cap and a pair of headphones. Perhaps realizing that music and business are like oil and water in the minds of many musicians, Artist Growth puts the “fun” in fundamental music business practices. From customizing your avatar to creating “action tasks” around gigs and other events, the platform seeks to drive independent musicians toward the business goals necessary to flourish as a modern musical enterprise. The Artist Growth crew is teasing a 2.0 release soon, but their current offerings are worthy of immediate attention. On the heels of this Editor’s Choice review of the app on evolver.fm, I decided to sign up and see what was up. After all, the green spherical avatar in the review looks exactly like me. I instantly fell in love with the gamified UI when I started by entering an upcoming gig. After entering contact info for the other members of the band, Artist Growth prompted me to add an “action pack” to the gig, which creates a checklist of promo suggestions to get maximum attendance. It even prompted me to set a tour itinerary upon gig creation, ensuring all members of my band know when load-in, load-out, (and most importantly) dinner is. Other highlights include useful functions to track band finances, generate set lists and schedule other tasks and appearances. These could all be easily handled outside of the app, but their inclusion shows a commendable commitment to completeness on the part of Artist Growth. While the business aids are a great mix of fun and functionality, the true asset Artist Growth has to offer is a partnership with The Indie Bible. The venerable directory of venues, press and media published for independent musicians is the backbone of the app’s “industry search” function. Splitting the U.S. up into regions, Artist Growth gives musicians the tools to comb through the nation’s music establishments and target them with promo and booking efforts. Rounding out the checklists and directories is “AGtv”, the app’s built-in video content targeted to musician-entrepreneurs. It’s a surprisingly well-developed aspect of the Artist Growth approach, featuring “channels” of content from the leading voices in career advice for musicians. From TuneCore to Taylor Guitars to Ariel Hyatt, all the big players are represented. I haven’t seen such a fully-integrated musician-entrepreneur app since Indie Band Manager established itself years ago as the utilitarian Swiss Army knife of self-managed musicians, allowing them to “rock both roles”. Artist Growth is today’s über-accessible platform to draw in and develop a new generation of musician-run small businesses. The mobile and web apps are not without their kinks. However, they persevere with a slick UI and a respectable balance of functionality and ease-of-use, and I see immense promise in their pioneering platform. 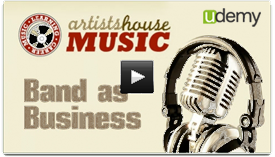 The Artist Growth business model is interesting. The company is riding the wave of new apps relying on a monthly subscription fee ($5 per install) rather than a one-time download price. This makes total sense for a service designed to be ersatz manager to notoriously non-business-minded musicians. I wouldn’t be surprised if bands that dutifully complete the “action packs” see up to a hundred-fold return for their investment. Of course, there will be many suckers on the line as well, paying their monthly dues like a gym membership for a couch potato. I’ll be on the lookout for Artist Growth 2.0’s relaunch — their $10/mo. “integrated” pricing plan looks incredibly competitive as a mass-market, more accessible TopSpin-style offering. 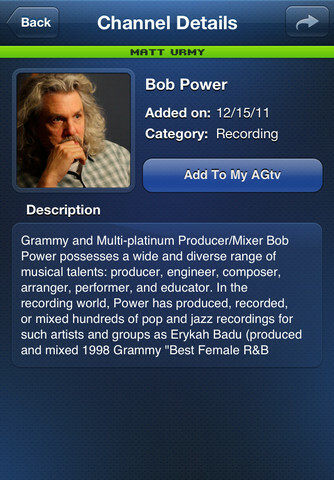 In the meantime, I greatly encourage musicians to check out their iOS app and give the 30-day free trial a shot.